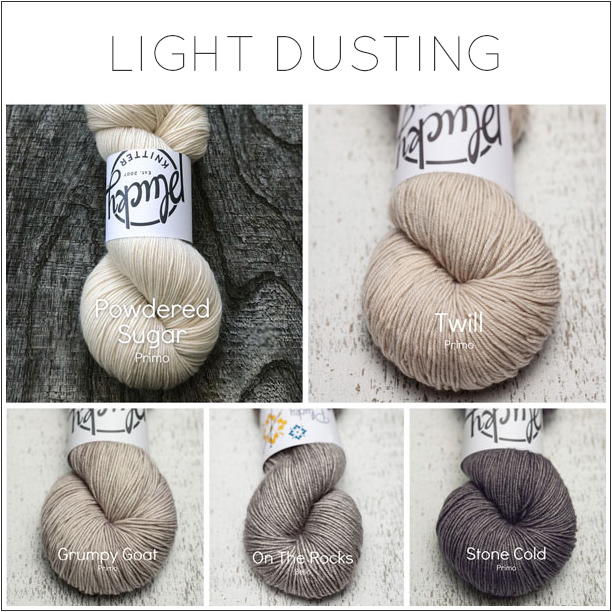 A Light Dusting – The Neutrals Update! It was a photo finish in the Color Crush contest with Light Dusting winning by a hair! We are delighted to offer not only the winning color combo, but a comprehensive palette of some of our favorite neutrals… because if a few are great, more is even better! And, also worth mentioning….. Phoebe and Halo are back and are a perfect match for these neutrals. Please join us on the Plucky Blog starting Friday, July 27th at Noon EDT and going through the weekend while supplies last. This is a pre-order update and will ship the week of August 27th. Please note, for administrative purposes your shipping label may be printed an unspecified amount of time prior to actually shipping. Once an update begins to ship it may take up to 4 business days for all packages to leave the barn. https://www.thepluckyknitter.com/wp-content/uploads/2017/05/new_small_logo@2x.png 0 0 Sarah https://www.thepluckyknitter.com/wp-content/uploads/2017/05/new_small_logo@2x.png Sarah2018-07-26 09:41:012018-08-01 10:09:37A Light Dusting - The Neutrals Update!